January never really feels like the beginning of the year to me. September, with its end-of-summer, back-to-school vibe, is the time of year that makes me feel like I'm starting over. January just feels like more of the same: more cold, more wet, more long, dark nights. But I can't help but look ahead and think about what I want to do differently in the garden this year. And I'm not afraid to call them resolutions. Everyone I know has become resolution-wary; when I ask them what their New Years resolutions are, they laugh and back away, saying, "Oh, no. I don't do resolutions." But really, what's wrong with resolve? What's the problem with making your intentions known? Are we really that afraid of commitment? Is there some penalty for not following through on a resolution that I haven't been warned about? More of it. I was just talking to another garden writer about how terrible our gardens look. People think that if you write about gardening, you must have the best garden in town. But the sad truth is that freelance writers spend far too much time in front of the computer writing about the thing they are interested in, not actually doing it. Last year I gave up my gym membership as a cost-cutting measure, and where did I spend the time that I used to spend at the gym? In front of the computer. This year, I'll be out in the garden more. It's the best exercise I know. More vegetables. I just got the Baker Creek Heirloom Seeds catalog, and it reminded me how much I love growing unusual and hard-to-find vegetables. I've already made plans to expand and improve my straw bale vegetable garden this year, and in a few months I'll be starting some seeds from Baker Creek. They have heirloom tomatoes from Iraq, sent by farmers who report that they are being encouraged to grow more modern crops and fear that their heirloom varieties may be disappearing; bizarre French melons covered with a thick, warty skin that looks like a winter squash, and, for the flower garden, 23 varieties of sweet peas. I'm all over it. Get tough on lavender. I love lavender, I really do. But mine is so overgrown and woody that it hardly blooms at all anymore. It's time to rip it out and replace it, a big job that I have put off for far too long. Look out, lavender, you're about to become compost. Grow more poisonous plants. You heard me. I've got a new book coming out this year -- I'll bore you with the details of that later -- but it's all about the dark side of the plant kingdom. Many of the most evil and fascinating plants I discovered in my research are tropical varieties that won't survive here. But I managed to clear out an enclosed, protected space by my kitchen door to grow some of the beautiful and deadly flowers I've been writing about. Many of them -- datura, castor bean, tobacco -- are annuals that need some pampering if they're going to reach a respectable size over the summer. So I'm starting some of those indoors this spring, too, so they'll be ready to go outside when the weather turns warm. Plant another fruit tree. Growing an apple tree has been such a delight. It's remarkable, given our temperamental climate, that something as seemingly complicated as an apple tree would grow so easily. The time to plant a fruit tree is right now; bare root varieties are showing up in garden centers around town this month. I highly recommend taking a workshop on fruit trees just to get a handle on the basics, but really, it's not hard. Miller Farms is offering berry and fruit tree workshops in January; give them a call for details. Water less. A friend who gardens in the Arizona desert recently said to me, "How do you know a plant is drought-tolerant if you water it?" Whoa. What a concept. I am really trying to grow a garden that can survive on natural rainfall, with a few exceptions: the vegetables get watered with a soaker hose, and the annual flowers that need extra pampering are all clustered together near the house so I can water them easily. But even my apple tree didn't get much water this year, and I was pleasantly surprised to learn from a few local apple farmers that they don't water their established trees, either -- or if they do, they give them one good soaking a month for just a few summer months. More heathers. Okay, this is a resolution I've made before and not kept. I get more fond of heathers every year, and I've watched over the years as newly-planted heather gardens in my neighborhood have grown into lovely mature plantings. The Fortuna River Lodge garden and the heather garden at the Mendocino Coast Botanical Gardens are also inspirations -- go check them out if you haven't already. 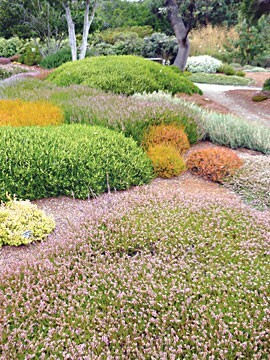 Maria Krenek at Glenmar Heather Nursery knows how to help plan a heather garden that will bloom all year long; this year I swear I'm going to clear a space and make it happen. Really. This is the year I'm going to finally do all this stuff. I swear.